This lake piece was begun right after I clicked the "publish button" late yesterday afternoon. I couldn't wait any longer to try the printed side of that overdyed and discharged upholstery fabric for a sky. It's cut into a number of pieces that are placed on the diagonal in order to get horizontal cloud patterns. Wisps of roving disquise the joins. This piece ended up with a lot of oil stick pastel work. I have no idea what prompted me to give it the red horizon ... other than a "whisper" from the lake itself. I don't know what I was thinking when those beach fabrics were selected. A whole lot of blending was needed there. However, without those strong contrasts it would not have ended up with the dramatic lighting that realistically would be the result of that kind of sky. This particular lake spoke to a friend that came to lunch today. It's now in her house. She, too, was a friend of Gayles. Having this piece with the sky fabric altered by Gayle's hand is meaningful to her. This is the large lake piece that was entered in the SMQ Guild show. I thought you may like to see it before the paint and oil stick pastel work were added to it. The collage part of these pieces is done with them laying flat on the table. I have an idea of the mood and kind of day while I'm building it with the fabric and thread scraps and roving. But it isn't until after the tulle is laid on top and the machine quilting secures all those tiny pieces that it can be put on the design board for me to see what is really going on. That is when I can see if there's need for added work to accentuate, or to obscure, or to add elements to the composition. The size of this large one dictated that a focal point was needed rather than just depicting a mood of the lake. That's why it has a sunset. I wanted to make a small version of #54. This one has some of the elements and coloring of the larger one. However, even if it too had a sunset it would have a different mood ... a different moment in time ... a different set of memories. It did not require additional work after it was quilted and viewed on the design wall. Both of these lake quilts use pieces of this fabric for the sky that was hand-dyed and discharged by my friend, Gayle. This is the reverse side of it ... the side used in each one. This is the right side of the scrap of the heavy cotton twill upholstery fabric given to me by one of my interior decorator friends. Gayle needed more fabrics for all the dye she had mixed up. Plus she was experimenting with discharge techniques at the same time. The next three lakes will get the rest of this fabric used for their skies. I wonder how they will be different from these two. Maybe I'll use the printed "right side" for one of them. It's this weekend that we usually leave for Michigan, but this year it will be another two weeks before we go. Our sons and their families are there opening the cottage. That involves turning on the water (consequently fixing leaky plumbing) and cleaning. I'm not missing that aspect at all. Although, there will be plenty left for us to organize and clean when we do get there. In the meantime, I can fantasize about the lake. This piece was made as a warm up to the large one (#54) that was entered in the SMQ Guild show. January was the last time that I had added to the lake series ... and that was the first since I had left Lake Michigan in the fall. "Sunbonnet Sue - Entrepreneur" by Sheila Rauen of Knoxville, Tennessee awarded 2nd Place in Small Art Quilt category. Sheila says, " This quilt is inspired by the vintage Sunbonnet Sue motif. I wanted to update her and show a modern business woman pursuing her dream to have a flower shop." Techniques include applique, fabric painting, free-motion embroidery and machine quilting. "Welcome Home" by Sheila Rauen of Knoxville, Tennessee in the Mixed Techniques Wall Quilts. Sheila says, "How many times has my Gabriel greeted me like this, when I get home? He's not just saying 'Hi,' but 'Feed me', too. Techniques include fabric painting, applique, free-motion embroidery and quilting." Sheila's sense of humor and fun just tickles me. 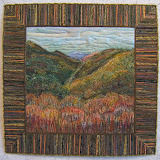 "My Elton" by Bonnie B. Ouellette of Seneca, South Carolina in the Mixed Techniques Wall Quilts. This piece was created for an auction to benefit the Elton John Aids Foundation. And yes, it is solid beading! "Sparkles" by Nancy Hahn of St. Peters, Missouri awarded 2nd Place in the Mixed Techniques Wall Quilts. There is an amazing amount of detail and sparkle to this quilt. However, I personally had a hard time focusing on it because of soooo many dots. 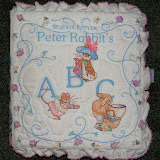 It is hand-appliqued using cotton, cotton lame and polyester lame. Outline hand-embroidery using metallic, rayon, and cotton floss. Machine trapunto, machine quilted with metallic and thread and hand-beaded. "Bugs and Butterflies" by Linda Luggen of Cincinnati, Ohio in the Two Person Team category. Linda says, "These bright and cheerful colors and cute bugs and butterflies welcomed my grandson, Will. Pattern is from a McCalls Needlework from the 70's. Quilted by Doris Goins." This one tickled me, too. I like the detail in the patterned wings. "Mosaic Window" by Kip Ford of Knoxville, Tennessee in the Two Person Team category. Kip says, "This is a fun quilt to make." The basic pattern is by Beverly Ingram, Piecemakers Quilt Club, Amarillo, Texas. Quilted by Robert Randall of Amarillo, Texas. This one inspired to begin a quilt for my great-nephew using this concept. I am using the Australian fabric collection purchased from one of our vendors (what's award money for?) plus a few from my stash. "African Ritual" by Kate Meyers of Sevierville, Tennessee in the Mixed Techniques Wall Quilts category. Kate says, "I collect African fabrics and batiks with a serious passion. I enjoy mixing and matching all the glorious colors." This is a Jan Krantz design with adaptions. "I Love Limes" by Carol snapp of Knoxville, Tennessee awarded 1st Place in the Pieced Wall Quilts category. Carol says, "My desire was to make an asymmetrical quilt. I found it inspiring to not follow a pattern and just let the quilt happen. I had never made a quilt without a border. The design was from a Mary Mashuta class." "Simply Fuchsia" by Marlene Brown Woodfield of LaPorte, Indiana awarded 1st Place in the Large Art Quilt category. Marlene says, "A branch of the fuchsia plant is featured on a hand painted background, surrounded by a window of needle-sketched leaves." This is one I stopped to study every time I walked past it during the 3 days of our show. The combination of the wonderfully painted whole cloth background, the colors, the composition, the bold shapes combined with the fine thread-drawing ROCKS. 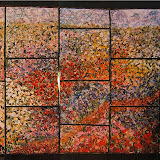 "Spring Riot" by Mary Ramsey Keasler of Cleveland, Tennessee awarded 2nd Place in the Mixed Techniques Wall Quilt category. Mary says, "A challenge with the criteria of being a season and using a technique never attempted before. I was inspired by Barbara Olsen's designs, her techniques and her applique method." "Fresh Snow" by Elsie Vredenburg, of Tustin, Michigan awarded 2nd Place in the Pictorial category. Elsie says, "Original design based on a photo of tree that I see on my daily walk." I can feel the crystals in the air just looking at the photo ... let alone seeing it in person. "The Waterfront - Capetown, South Africa" by Cynthia Hall of Asheville, North Carolina awarded 3rd Place in the Pictorial category. The only description from her for the show booklet is that this is "original art" and is for sale. "Courtship" by Tone Haugen-Cogburn of Maryville, Tennessee awarded 2nd place in the Appliqued Wall Quilts category. Tone says, "This was inspired by a deck of playing cards. It was done using my own freeform machine applique technique." It is machine quilted. "Floating" by Patty Ashworth of Oak Ridge, Tennessee awarded 1st Place in the Appliqued Wall Quilt category. Patty says, "I loved the background fabric and didn't want to cut it up, so I did the designing of the 'ribbons' and circles to fit on the background." I hear a symphony when I look at this one. Patty and Tone are two of the four member quilt group, The Out of Towners, who create fabulous award winning quilts locally, nationally, and internationally. Candace Tucker and Bridget Wilson Matlock are the other two. 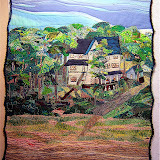 "Amish Inspired Unequal Nine-Patch" by Jan Wass of Vonore, Tennessee awarded 3rd place Pieced Wall Quilts category. This small quilt has big visual impact. It's made of two pieces from Caryl Fallert's "Graduations" line of fabrics by Benartex. Jan was inspired by an Amish bed quilt, ca.1870, in the collection of the Illinois State Museum. 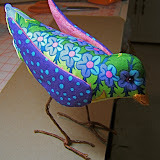 If you'd like to make one, too, the pattern and instructions can be ordered from Jan's website. The quilts presented here and in the last several posts are those that I either had a connection to or they had personal appeal to me. To see all the quilts exhibited in this show go to the Smoky Mountain Quilt Guild website. PS: Viewer's Choice ribbon was awarded to "Wistful Willow" by Linda Roy of Knoxville, Tennessee. Woo Hoo! "Irish Cream" by Linda Roy of Knoxville, Tennessee awarded 1st place in Applique/Mixed Techniques Bed Quilts category. A close-up photo gives you an idea of the rich texture of this luscious monochromatic quilt. It reminds Linda of the texture of Irish knit sweaters made by her grandmother for family members through the years. It's an original design made with hand-applique, trapunto, and of course it's hand quilted with exquisite stitching. "The Grannies' Delight" by Kelora Goethe of Knoxville, Tennessee awarded 3rd place in Applique/Mixed Techniques Bed Quilts category. Kelora says, " This quilt is made to honor the amazing needle women in our family tree. Baltimore blocks from Baltimore Bouquets by Mimi Dietrich. The rest of the quilt is original or traditional." Click on the photo to see all the embroidery and crocheted lace motifs incorporated throughout the design. "At Piece With Time" by Barbara O'Melia of Sellersville, Pennsylvania awarded 3rd Place in Mixed Technique Wall Hanging category. Barbara says, "This quilt was made from the book At Piece with Time, by Kristin Steiner and Diane Frankenberger. The blocks surrounding the center star each represent a milestone in a woman's life - from childhood to old age." "Redwork Beauty" by Cathy Bingham of Knoxville, Tennessee in Mixed Techniques Wall Quilt category. Cathy says, "This quilt was started in a class taught by Betty Alderman. It will always be special to me because I hand quilted it while spending time with my mother before she passed away. It's from B. Alderman's Favorite Applique and Embroidery Quilts book." "Mama's Garden" by Lynda Wallace of LaFollette, Tennessee awarded an Honorable Mention in Mixed Techniques Wall Quilt category. Lynda says, "This very much reminds me of my grandmother , a gentle lady who loved me and her flowers. I miss her. Hand and machine quilted with hand embroidery and beading." "Ocean Waves" by Ann Rushing of Maryville, Tennessee in the Two Person Team category. This quilt was constructed during a difficult time in Ann's life which is reflected in her choice of the "wave" pattern fabrics. It's hand quilted by her and the Pleasant Hills United Methodist Quilters. "Squeeze Left" by Loretta Painter of Norris, Tennessee in the Large Art category. Loretta says, " This quilt was inspired by a sign seen during a trip to Canada that read, 'Road Construction Ahead Squeeze Left'. The colors in the quilt reflect the sky, fields, forests and lakes that we enjoyed on vacation." I asked her if the blocks had been made larger and then trimmed to this "squeeze left" size ... they were constructed to the size you see. "Coloring Outside the Box" by Joanne Holmes of Knoxville, Tennessee awarded an Honorable Mention in the Two Person Team category. and was way outside of her comfort zone. "Delerious" by Carol Snapp of Knoxville, Tennessee awarded an Honorable Mention in the Two Person Team category. This quilt is the result of a challenge among six friends. The requirement was for the same dark green fabric be used by all participants plus three embellishments. Carol's are buttons, crystals, and thread. She used a pattern by Karen Stone with an original twist. It was quilted by Martha Centers. "Taj Kaffe Toole" by Phyllis Callaway of Cleveland, Tennessee awarded 2nd place in the Pieced Bed Quilts category. This quilt was inspired by a Kaffe Fasset quilt and features fabrics from Peggy Toole's Florentine Collections. It contains 37 fabrics and was made for her daughter's 37th birthday. "Princess Tree" by Gerry O'Neill of Oak Ridge, Tennessee awarded 3rd Place in the Appliqued Wall Quilts category. Gerry says, "This traditional Hawaiian quilt was inspired by the beautiful Princess tree, Paulownia tomentosa, which grows along I-40, in the Great Smoky Mountains. In June, it bears it spikes of purple flowers and the previous year's see pods simultaneously." "Fern Glade" by Hallie O'Kelley of Tuscaloosa, Alabama awarded 3rd Place in the Pieced Bed Quilts category. The fabric for this quilt was dyed and screen printed by the maker. It is hand quilted. I've been studying this quilt for three days and cannot figure out how that center is done. Each strip is printed and seamed to the next. How did she get the fern pattern to traverse across all those separate pieces. Talk about precision! There will be more quilts that I liked posted here tomorrow. The First Quilt ribbon is awarded to "What I Love About Christmas" by Danette Gilbert of Knoxville, Tennessee. The squares were machine embroidered with Christmas themes. This was Danette's first attempt at trapunto as well as being her first quilt. The Surface Embellishment award is sponsored in the name of Amber by her grandmother who is on our guild board. She and her grandmother came to meet me and see my quilt. I hope that my sense of playfulness and the fun I have in creating quilts came across to Amber while touring my and some of the other quilts in our show. Oh, to think of the possibilities that lie ahead when you can begin so young. Lucky her that she has a grandmother to expose her to them. "Northern Lights" made by Tone Haugen-Cogburn of Maryville, Tennessee entered in the Group Quilt category. This is one of three quilts finished by our group that participated in the block exchange from which my above quilt grew. Tone's theme was northern lights. "Home, Sweet Home" by J.C. Werkhoven of The Netherlands entered in the Group Quilt category. Another quilt that resulted from that block exchange. J.C.'s theme was funky houses. Her presentation is most clever. 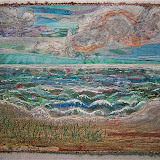 "Best Wishes For Africa" by J.C. Werkhoven of The Netherlands entered in the Small Art Quilt category. J.C. says, " Made with African and Indonesian fabrics. By applying these, my thoughts go out to all people in Africa, who are touched by all the conflict that is going on there at the moment. It is pieced and quilted by hand." 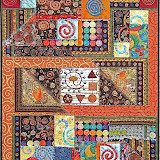 "All Buttoned Up" by Judi Hoffman of Knoxville, Tennessee awarded 2nd place in the Large Art Quilt category. It really is all buttoned up, allowing for the interchange of designs and the size of the quilt to suit one's mood. 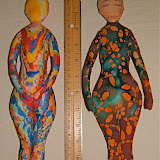 Judi already has other pieces that can be interchanged with these and plans for more. This could possibly be a never ending project. 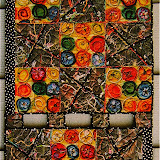 "Mood Swings" by Pat Kumicich of Naples, Florida awarded 3rd place in the Large Art Quilt category. Pat says, "Being a woman of a 'certain age' I have many mood swings - just ask my husband." You can imagine there are quite a few viewers at our show that "get" this one immediately. "Transparency" by Tone Haugen-Cogburn of Maryville, Tennessee entered in Other Techniques category. Tone is taking a City's and Guild course. This piece comprised of her own hand-dyed fabrics was her solution to one of the course exercises. The first panel is "pojagi" a Korean wrapping cloth. The second panel is Japanese folded block technique, and the third panel is a variation of the cathedral window. See-through cottons and silks are used for the transparent effect. 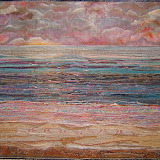 "Thangka: Summer Grace" by Sue Spurlock of Carbondale, Illinois entered in the Small Art Quilt category. She says, "A thangka is a Buddhist image on which to meditate: to center and awaken. It emerged from a painful time in my life when I was struggling to accept loss, change, and betrayal. Each color and stitch evolved from my rising and falling emotions and thoughts, helping me to feel and accept my losses and forgiveness as acceptance emerged. All work by hand." That is a most exquisite piece with shimmering silks and extensive beadwork in complex patterns. Gazing at it makes me feel centered and still. If I were the judge, this quilt would've received the Embellishment ribbon. "Night Falls on the Feng Shui Gargen" by Diane Rhea of Loudon, Tennessee awarded an Honorable Mention in the Large Art Quilt category. Diane says," I started this quilt because I wanted to experiment with circles, angelina fiber, metallic thread, lame, and beads. This quilt 'evolved' as I worked on it. The circles became flowers in my Feng Shui Garden." I can't help but feel this piece could be rotated one turn to the right ... but then, it's not mine and I don't know much about Feng Shui... just an opinion based on my sense of balance. "Miss Pansy" by Debbie McMurray of Alcoa, Tennessee entered in the Pictorial category. This originated as a photo transferred to the center fabric panel. Thread play expands the image and gives it sparkle and life. Twists of wool roving are couched at the edges to frame the flower. 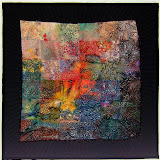 "Falling Leaves" by Ann Rushing of Maryville, Tennessee awarded an Honorable Mention in Small Art Quilt category. Ann says, "This quilt began in a Judy Simmons class in 2006. I used real leaves and transferred them to image paper and then to fabric. The leaf edges were finished with a wood burner." The leaves are tacked with just a few stitches to hang loosely on the surface. It's the pure essence of fall in a small patch of color. "South Port" by Dena Bauer of Wadesville, Indiana entered in the Pictorial category. Dena says, "This live oak tree root photo was reproduced on fabric and machine quilated. The root was so detailed that the photo needed only to be cropped." The quilting patterns and colors add richness and depth to this piece. It's oh so much more than a photograph. What I want to know is where does one get this large of a photo transfer. It's about the size of four standard (8 1/2 x 11 inches) sheets of paper. I'll share more of the quilts that capture my attention tomorrow.